Acquired in 1992 when Chicago's River West neighborhood was considered uncharted and dangerous. 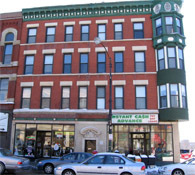 Baum Development recognized a unique opportunity to reposition a mixed-use property at a heavily trafficked, but unpopulated River West intersection located at 1111 W. Chicago Avenue. Commuters are in abundance at this intersection due to the various public transportation outlets, including the busy Chicago Blue Line train stop. The property had been mostly vacant for decades and was a haven for drug dealers. Baum completely gutted and renovated the property with a loan from the Community Investment Corporation. The 10,500 square foot, four-story mixed-use building consists of nine residential units and two commercial spaces currently occupied by an architect's office, a local pizzeria and a currency exchange. The nine rehabbed residential units are all currently occupied as well. The building remains a core investment property within Baum's portfolio. Neighborhood residents and officials view the project as a catalyst and key component in River West's growth and economic prosperity. Baum received the 1994 Chicago Association of Realtor's Good Neighbor Award for Best Mixed-use Rehab for their work at 1111 W. Chicago Ave.